Autodromo Nazionale di Monza. 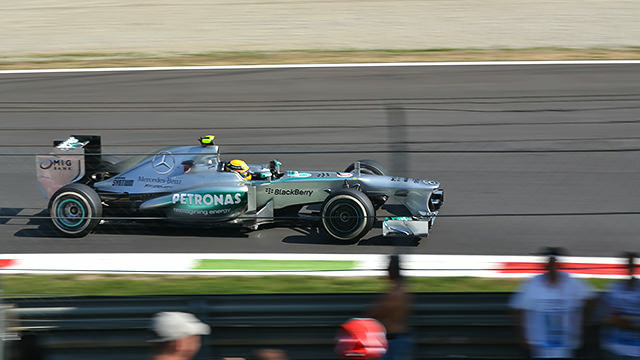 The Formula 1 Gran Premio D'Italia 2013. The home race of Scuderia Ferrari. The Cathedral of Speed. Monza is one of the oldest, and fastest, circuits on the F1 calendar and attending a race there is an experience that I’ll never forget. The circuit is beautiful, and fantastic to walk around. The trees cast fantastic shadows on various sections and the old banking, which can be seen from many grandstands and pathways, reminds you of the history of the track. I’d seriously recommend visiting Monza - even if it isn’t a race weekend. It was the old banking that really made the weekend for us. 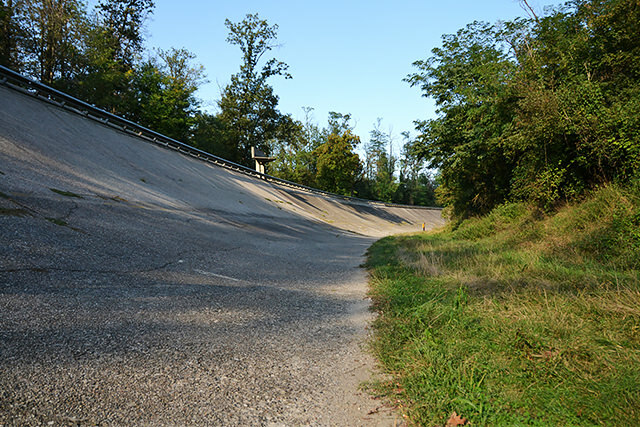 On Saturday, like many of the fans visiting Monza, we went on a mission to get onto the old banking. Unfortunately for us, the organisers had posted guards to stop people getting onto it, or close enough to get a good photo. After some negotiations with a younger guard, he directed us through a wooded section, down a small path to find his friend guarding another section, and to our delight they let five or six of us down and onto the banking for five minutes or so. Hands down, those five minutes were the most special of the weekend. The history seeps from the old curves; you get a real sense of the bravery of the drivers who raced on them. They are a tangible link to the sport's past and watching today’s cars hammer around the Parabolica with the old track in the background is what really makes Monza a special circuit to visit. The atmosphere on race day at Monza is nothing short of electrifying. It’s almost as if you can feel the excitement, the anticipation and the passion of the Tifosi in the air. In the past I’ve been to both the British GP at Silverstone and the Belgian GP at Spa Francorchamps and neither of these two races match the atmosphere at Monza. The Tifosi really make the experience. Throughout the weekend, every time Fernando Alonso or Felipe Massa raced past a cheer rose from the crowd, horns would sounds and flags would wave. Red flares were frequently set off and more than once we heard a rendition of the Italian national anthem from Ferrari-clad fans. We even saw a group of Tifosi who had built a model of the F2013 over a trolley and wheeled it around with music blaring from speakers attached to it. The passion they have for Ferrari is huge, and if you don’t support Ferrari you are barely worth noticing. In fact, on our first day at Monza (Thursday) as we were coming back from watching pit stop practice I got stopped in the street by a Italian fan who pointed at my Kimi Räikkönen Lotus cap and simply stated “Ferrari are faster” to which I dutifully replied “For Sure! Much faster!” and continued on my way. It’s this passion that makes the GP, and makes it one that I would definitely return to. Personally, I’ve never been that much of a Ferrari kind of guy; I first started watching F1 as Schumacher left Benetton for Ferrari and began to dominate the sport – which I found kind of boring. 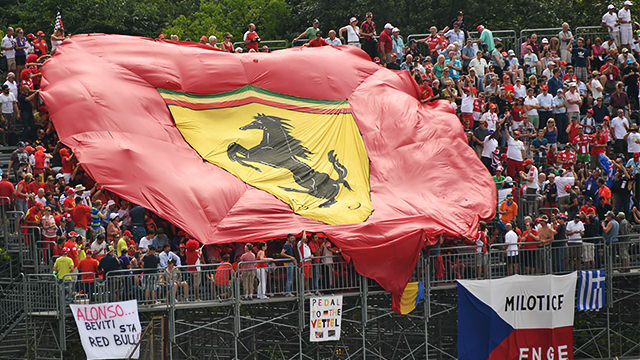 But, the Tifosi made it impossible not to want to join in. All three of us bought ourselves some Ferrari shirts for race day and joined the Tifosi. The race day was great fun, and the racing was great too. We were lucky enough to be sitting on the outside of the Variante del Rettifilo, right at the first chicane and the sheer tension as the lights turned from red to green and 22 cars hurtled towards the chicane was incredible. The whole grandstand shook and wobbled with excitement both at the beginning and at the end of the race - at the start because everyone was cheering the drivers on and at the end as people scrambled to get down and onto the track for the traditional post-race invasion. There really is something special about watching a Ferrari roar past at Monza, even if you aren’t a fan, and wearing the Scuderia colours on race day was great fun – a day with the Tifosi that was well worth it.